Elements 15 has a variety of automatic lighting-, contrast-, and color-correction tools that can improve the appearance of your images with just one menu command. These commands are available in either Expert or Quick mode, and they’re all on the Enhance menu. 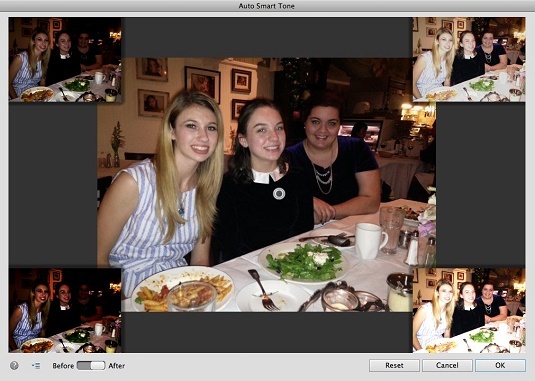 The Auto Smart Tone auto fix is designed to adjust the tonal values in your image. In either Expert or Quick mode, with your image open, choose Enhance→Auto Smart Tone. Elements automatically applies a default correction. Moving the controller “joystick” (double circle icon in the center of the image), fine-tune your correction. The thumbnail previews in each corner give you an idea of how the image will look when you move the joystick in that particular direction. Move the Before and After toggle to see the before-and-after adjustment previews. Select the Learn from This Correction option (arrow with lines icon) in the lower-left corner of the dialog box to have Elements “learn” from this editing session. If you select this option, Elements remembers the corrections you made on this image and positions the joystick on the basis of that correction on the next image you open and correct. The more images that are corrected, the smarter the Auto Smart Tone corrections become. This intelligent algorithm can distinguish between various image types (based on the tonal characteristics) and remembers the adjustment for that particular type of image. If your adjustments are starting to get out of whack and you need to reset the learning archive, choose Edit → Preferences → General → Reset Auto Smart Tone Learning (on the Mac, Adobe Photoshop Elements Editor → Preferences → General → Reset Auto Smart Tone Learning). After you’re satisfied with the adjustment, click OK. If you want to start over, click the Reset button. Apply Auto Smart Tone to quickly adjust the tonal values in an image. The Auto Smart Fix tool is an all-in-one command touted to adjust it all. It’s designed to improve the details in shadow and highlight areas, and correct the color balance. 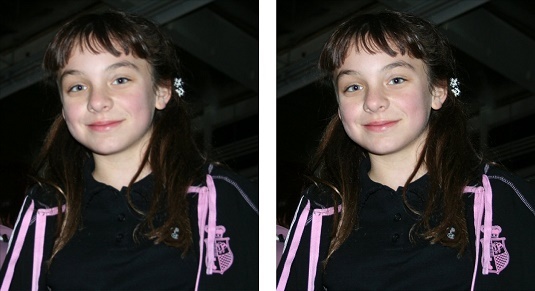 The overexposed image on the left was improved quite nicely with the Auto Smart Fix command. In a hurry? Apply the Auto Smart Fix command to quickly improve an image. The Auto Smart Fix command, as well as the Auto Color, Auto Levels, Auto Contrast, Auto Sharpen, and Auto Red Eye Fix commands, are also available in the Organizer (in the Photo Fix Options pane), where you can apply the commands to several selected images simultaneously. The Auto Levels command adjusts the overall contrast of an image. This command works best on images that have pretty good contrast to begin with and need just a minor amount of adjustment. Auto Levels works by mapping, or converting, the lightest and darkest pixels in your image to black and white, thereby making highlights appear lighter and shadows appear darker. Although the Auto Levels command can improve contrast, it may also produce an unwanted color cast (a slight trace of color). If this happens, undo the command and try the Auto Contrast command instead. If that still doesn’t improve the contrast, it’s time to bring out the big guns. The Auto Contrast command is designed to adjust the overall contrast in an image without adjusting its color. 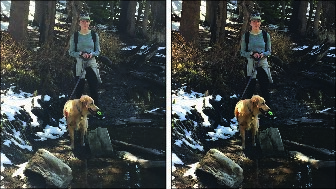 This command may not do as good a job of improving contrast as the Auto Levels command, but it does a better job of retaining the color balance of an image. Auto Contrast usually doesn’t cause the funky color casts that can occur when you’re using Auto Levels. This command works well on images with a haze. The Auto Contrast command adjusts contrast without messing up color. Although the Auto Contrast command does a good job of removing haze in images, the new Auto Haze Removal command does a great job with this task. But also be sure to check out the Haze Removal command under the Enhance menu in both Expert and Quick modes. Under that command, you have a couple more options to really home in on adding clarity to your image. The new Auto Haze Removal command works wonders on hazy images. The Auto Color Correction command adjusts both the color and contrast of an image, based on the shadows, midtones, and highlights it finds in the image and a default set of values. These values adjust the amount of black and white pixels that Elements removes from the darkest and lightest areas of the image. You usually use this command to remove a color cast or to balance the color in your image. Occasionally, this command can also be useful in correcting oversaturated or undersaturated colors. The Auto Shake Reduction is designed to reduce the blur caused by camera movement; this auto adjustment is pretty effective. You can also find a more robust manual adjustment by using the Enhance → Shake Reduction command. The new Auto Shake Reduction command reduces blur caused by moving your camera. Photos taken with a digital camera or scanned on a flatbed scanner often suffer from a case of overly soft focus. Sharpening gives the illusion of increased focus by increasing the contrast between pixels. Auto Sharpen attempts to improve the focus without overdoing it. What happens when you oversharpen? Your images go from soft to grainy and noisy. The Auto Red Eye Fix command is self-explanatory. It automatically detects and fixes red-eye in an image. Red-eye happens when a person or an animal (where red-eye can also be yellow-, green-, or even blue-eye) looks directly into the flash. You can also press Y.
Pupil Radius: Use the slider to increase or decrease the size of the pupil. Darken: Use the slider to darken or lighten the color of the pupil. 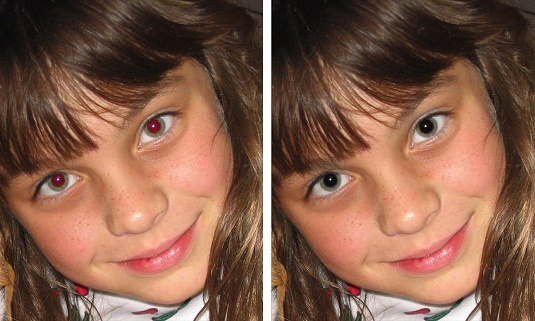 The Auto Red Eye Fix and the Red Eye tools detect and destroy dreaded red-eye. Pets can get white-, green-, blue-, or yellow-eyes from the flash. Elements provides a Pet Eye option in Tool Options. If this option still doesn’t do it, your best bet is to use the Color Replacement tool.